Wow, when life gets busy it really gets busy! My apologies for such a delay in posting. My fiancé and I are just a few weeks out from our wedding and things have gotten so hectic around here. I’ve thought many times about getting my next blog up but then something gets in the way. Fortunately, I had some time today to finish this one up and get it out to the masses! Ampawa Floating Market near Bangkok. 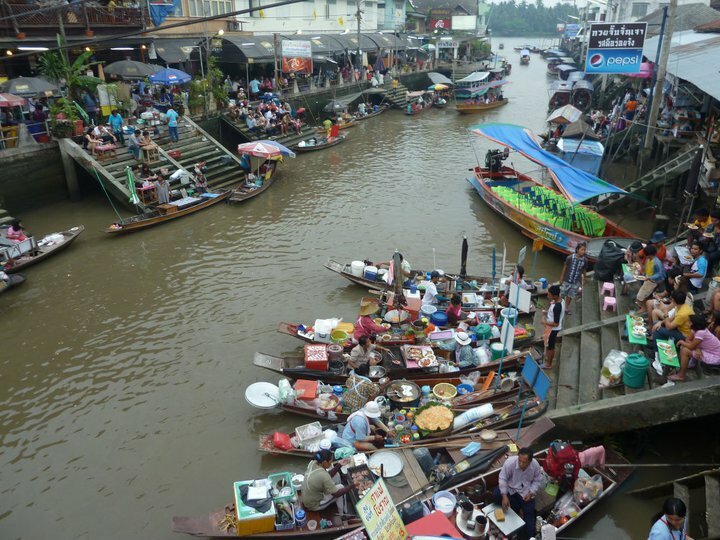 Floating markets are a BIG part of central Thailand culture. I’ll be writing a blog entry about them soon! One of my last blog posts was Part 2 of my four-part series on regional cuisine that focused on southern Thailand. Next up in our tour of the Thai regions is Central Thailand. Central Thailand is a pretty interesting region for Thai cuisine because there are so many regional influences. This is a fairly large region that is very densely populated and is made up of many different smaller regions. Right in the center of this region is the country’s capital of Bangkok, which has naturally become a magnet for all different types of people and cultures and therefore, all different specialty cuisines. It’s this mish-mash of influences that defines central cuisine. Before we get to some of those influences though I want to chat a little bit about the geography of the region. As we discussed in our post on Northern and Southern cuisine, the topography and weather of a particular region greatly influences the food that comes out of that area. Central Thailand happens to be a delta-like landscape, fairly flat but packed with rivers and water sources. This maze of waterways has created a landscape of extremely fertile soil that allows nearly any type of crop to be grown successfully. As such, the cuisine in Central Thailand is far more diverse than some of the other regionals. The central region is what influences and inspires many of the American dishes you’ve enjoyed here in the states. Dishes like tom yum (hot and sour soup) as well as tom kha (a similar soup with a coconut base) originated in this region as well as yam salads and many different stir fries. Additionally, the central region also houses a large Chinese population and thus is heavily influenced by Chinese cuisine which shows itself in the variety of noodle dishes you can find including kuay tiaw, pad see ew, and Phad Thai. It’s important to note (at least it’s important to me!) that most of the versions of Phad Thai that you find in the states are very far from the authentic version you’d find in Thailand. Believe it or not, authentic Phad Thai doesn’t have a peanut sauce! Crazy, I know. Mind blown. 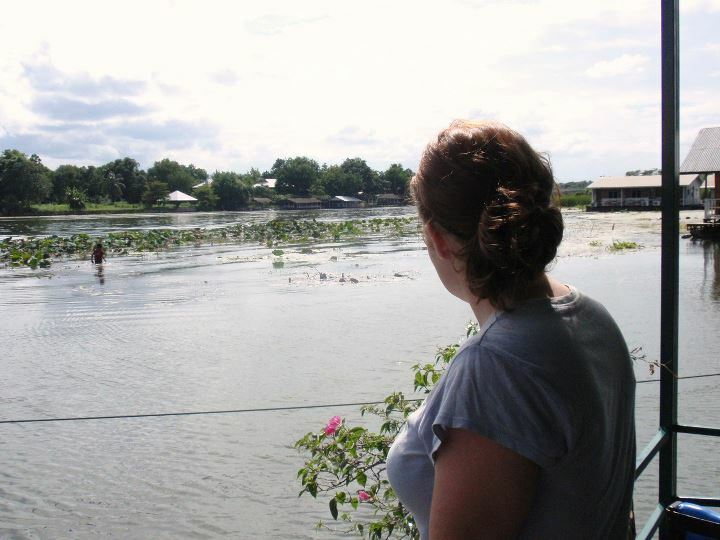 This is me overlooking the River Kwai in Kanchanaburi, Thailand … one of the many waterways in Central Thailand. Central Thailand produces the best rice in the country. This includes all different types of rice, but the most popular is hom mali or the ever popular jasmine rice. Many of the smaller regions throughout the central region have specialty cuisines specific to their area. These range from desserts, to noodle dishes, to curries. You can travel extensively through the central region and never have the same dish twice. It’s glorious! Many meals in the central region include an omelet of some kind, also called kai jiaw. Yummy, these omelets are seriously by favorite. Take an egg, whisk it in a bowl, pour it into a wok full of hot oil, let it fry, and serve. Heaven. My favorite type of omelet is not the plain one described but actually one that fried oysters and bean sprouts. It’s called hoi tawt and it’s incredible and I should really get the recipe up on here soon. If you’re not into oysters, you can also add ground pork, vegetables, or anything else you want. Wow, I’m getting really hungry over here. The goal of cuisine in central Thailand is to find that perfect combination of spicy, salty, sweet and sour … and often times a little greasy! This is accomplished by serving nearly every dish with some sort of dipping sauce as well as many dried spices. Any restaurant you visit in central Thailand usually has a condiment container that includes some of these yummy dish-toppers. The final thing to note. While many of the dishes you enjoy at your local Thai restaurant are heavily influenced by this region that does not mean they are authentic! Not to harp on these restaurants, but they usually cater to the American crowd. They substitute or add certain ingredients that Americans happen to love, but are not actually used in the authentic dishes in Thailand (example, carrots). If you’re looking for truly authentic central (or other regional) Thai cuisine, my best advice is to jump on Yelp and look for restaurants with positive reviews from actual Thai people. You may find a restaurant with amazing reviews, but if they’re from people who have never experienced authentic Thai cuisine, you’re not necessarily going to find authentic food at that establishment. 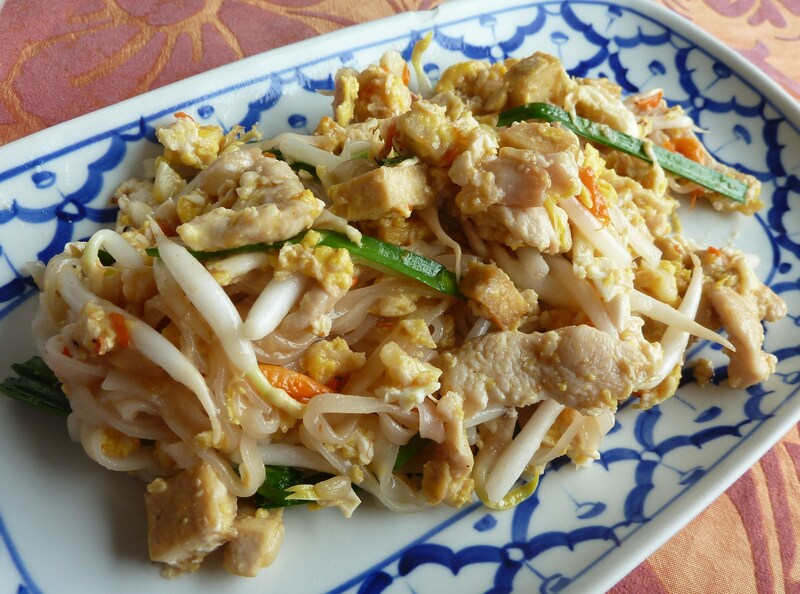 Okay, so here is your recipe for this region – the ever popular Phad Thai. This is an authentic recipe that I reworked based on the recipe we learned at our cooking class in Chiang Mai. It’ll be a bit different than what you’re used to from most Thai restaurants but trust me, it’s delicious! This one is Phad Thai Jay, jay meaning vegetarian. You can also add chicken if you’d like. If you do, add the chicken before adding the garlic, shallots and tofu. Cook until almost cooked through, then move on to step 5. It’s also a difficult recipe to master; it requires a lot of different steps in a short amount of time. Be sure to read through the recipe and understand what you’re doing before you jump in and cook. Good luck. Cut the chive blades into 1-inch pieces; reserve bottom parts for garnish. Mix 1-inch pieces with bean sprouts and set aside. Set a flat pan or wok over medium-high heat, add half of vegetable oil. Once oil is hot, add noodles followed by sauce (and shrimp oil is using); stir constantly keeping the noodles moving at all times. After 30-40 seconds or once noodles are slightly softened, push them to one side of the pan and add the remaining vegetable oil. Add garlic, shallots, and tofu (if using). Stir on one side of the pan but still move noodles around on other side so they don’t burn. Once garlic and shallots have browned slightly mix in with the noodles and push mixture back to one side of the pan. Pour broken eggs onto empty side of the dish; scramble with spatula and then let cook undisturbed on one side of the pan before flipping and breaking them into smaller pieces. Once eggs are done your noodles should be soft and chewy, sauce has been absorbed into noodles, and little bits of shallots and garlic are crispy. Take off the heat and mix all together. Add two handfuls of chive-bean sprout mixture and give a gentle stir. Serve topped with 2-3 TBSP chopped peanuts, a wedge of lime, and chive stalks. Season individually to taste with fish sauce, sugar, and dried red pepper flakes. This dish cooks very fast! Make sure that you watch the heat, add things immediate, and don’t overcook. This is one of the more stressful dishes to make (at least for me!) and definitely takes practice! Cooking the egg is the hardest part! You want to make sure the excess water is out or it will end up a goopy mess. Let the egg fry up. You can break it apart and sort of scramble it in the pan as well. Any method works.